A U.S. animation and distribution company founded in 1980. Most famous for localizing the Toei Animation series GoLion to the United States back in the 80s, which became Voltron: Defender of the Universe. Voltron then went on to become a major pop culture icon, especially since it was the only mecha show on U.S. television (as opposed to being one of many back in Japan). The company is based in St. Louis, Missouri where it's owned by the Koplar family, the previous and founding owners of KPLR-TV, now the St. Louis The CW affiliate. Most of World Events' properties are currently licensed to DreamWorks Classics, a unit of Universal Studios. The company has a website for themselves along with a YouTube channel and separate website for Voltron . World Events, a current events production, and the company's first production. Voltron: The Third Dimension, a CG-Animated sequel to "Lion Voltron". It won an Emmy Award for Outstanding Sound Editing, but has garnered mixed reactions from fans. Voltron Force, a joint production with Kickstar Productions and Classic Media. Artifact Title: WEP's name was derived from their first television series of the same name, which was a documentary series relating to current events of the time. Although the studio rolled with the name throughout the 80's by claiming it was meant to represent their goal to create animated content that would be seen as "an event" by viewers. Descended Creator: Co-founder Peter Keefe provides the narration for the studio's first TV series World Events. Early Installment Weirdness: The company's first foray into television was with a live-action documentary series covering current events in the world called, fittingly enough, World Events. Urban Legend of Zelda: Keefe's obituary from The New York Times claims that he regularly made Creator Cameos on Voltron during it's original 1984 run. However, since the article doesn't mention any character names or possible alias used in the credits, it's unknown whether or not this claim has any merit; and it's unlikely we'll ever find any evidence to support it following Keefe's death in 2010. 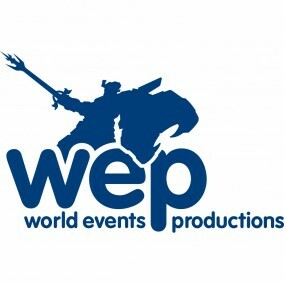 Lost Episode: WEP's first TV series World Events no longer seems to exist in any format and trying to find information on the show will lead to dead-ends on the web.